Actually managed to finish a new map today. For those interested, current world map. Update available on the github page. hope your moving to a new location went well. Can't play JA2 without bigmaps anymore, so I'm waiting the next City to gets finished somewhere in the future for my next game. I'm always looking forward for updates / a new picture of the worldmap. Can't open this one though. Two new maps added (H3 and H4... yes, that actually includes a new city sector!). Overheating can now be a thing in AIMNAS... I added 30 different quick change barrels (they use the same pic atm, so don't get confused...). For testing reasons overheating has been enabled in the ja2options.ini. If you don't like overheating, you should set the value to FALSE in the ini. Any chance for a X-Mas AIMNAS release this year? Currently upping the AIMNAS X-Mas Update to github... enjoy and happy holidays everyone. Another gift for new year, thank you ! Hi Smeagol, nice work on xmas release! good to see that progress. Hi Smeagol, I hope the move went well and the twins (as well as the rest of your family and of course yourself!) are well. Thank you for your continued efforts in bringing us this content so that we can keep enjoying this old game, it goes to show that a few dedicated and passionate people can expand a games life well beyond it's intended years. New github update available containing finished H2 map! Curious how far the map has come since the last time I've seen, any links? Me too, how far is it? The idea is so cool! Current progress on the mod will keep you entertained for quite a while. As far as being finished... well, it'll take some more time. The updates are steady though. Y'all keepin us folks entertained! first of all, thanks for all the work and time you put into this so us plebs can after all these years still enjoy this old gem in a different (and better!) way again and again. Honestly, much appreciated! Im planning on doing another playthrough. Last one i used Arulco Revisited, which i enjoyed very much, however i really want to use some of the newer 1.13 features and from what my "research" around here told me that only works with either pure 1.13 or ANIMAS. Now my question is: how far will i get through the campaign until things likley start to break? What ive been reading a lot here and what the FAQ says is that some quests are generally broken, but some of those posts are over a year old. I havent read anything else however so i figured thats still the case. Will i be able to finish the game? From what i undestand all Deidranna sectors are still untouched, but will the game just switch to vanilla maps wherever there is no bigmap or will things go weird? Does anyone still have a working version of the map? There is a view of such a map, only a newer version..
Well if you desire an updated Version of the BigMaps Mosaic Overview Map, you'd be able to update it yourself. 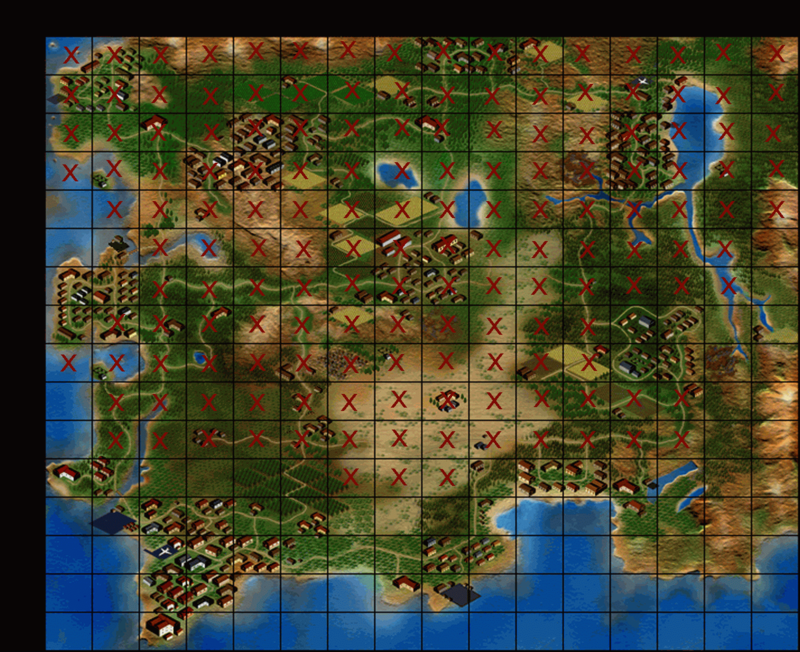 After all, all current BigMaps are downloadable except for the WIP-Maps. quick question, is there any problems with the underground facility in Orta? or is it my computer? thing is that i just liberated orta and blew up the wall that leads to the stairs down to the underground facility, but the problem is that whenever i try to get down the game crashes. i haven't had that problem anywhere else so far so it seemed to me that perhaps there's a mod problem, or it's just my computer that is like way too slow, like literally takes me about 5 minutes to load a savegame. Since a lot of links died, I'm confused as to what BigMaps is. From what I understand, AIMNAS uses 1.13-compatible Wildfire maps, and BigMap is a project in which AIMNAS items are strategically placed within those Wildfire maps? So the 1.13-compatible Wildfire maps found elsewhere is an unrelated project? BigMaps is a project to create completely new, much bigger maps for 1.13 and integral part of AIMNAS. But still WIP, making the maps lack items in crates etc. stupid question, any can i upgrade my bigmaps version and play my old savegame? How far have things progressed since May? I'm still psyched for this! Yes, your maps will just replace your old ones, there may be some old data left over with things like items, but your saves should be compatible. might be a bit more motivated to get something done this year. Hi, just wanted to thank you for all your work, I know how it sometimes hard to continue without any support. Be sure there a lot ppl still looking for your mod constantly, they just a bit lazy(as myself) to write even a few words. Really waiting for complete version, still playing current one. AIMNAS is the future of JA2 modding, enough said. True that. I've tried other JA2 mods, but always felt they lack something and in the end I return to AIMNAS even though it's not yet finished.